Here is a great offer if you are flying Virgin Atlantic in Upper Class out of Vancouver for the next month or so (VS' seasonal YVR service ends on October) or if you are flying them out of one of many U.S. gateways. Not only does it offer bonus miles, but it also offers bonus elite qualifying tiers points (perfect timing as we approach the end of the year) and complimentary flights awarded after you complete your first qualifying flight! 50% extra Flying Club miles and 2 bonus tier points will be awarded to a Qualifying Member on completion of each of the first, second, third and fourth Qualifying Flights. These promotional bonus Flying Club miles will be calculated on standard miles earned per sector and exclude Flying Club Silver and Flying Club Gold tier bonus miles. 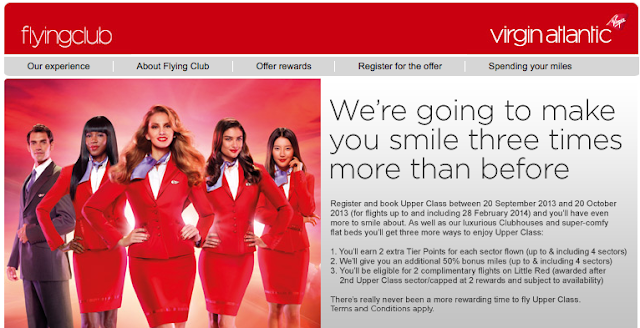 One return flight on the Virgin Atlantic Little Red service (a "Little Red Reward Flight") will be awarded to a Qualifying Member on completion of each of the first and second Qualifying Flights. Can't make use of this promotion? Be sure to visit our Flying Club Bonus Miles page for dozens of other flight, hotel, car rental and other bonuses!